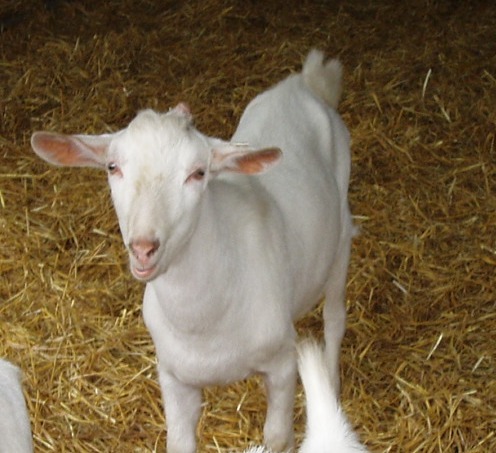 Ellie's Dairy - The Finest Goat Milk, from Kent: The boy is back in town! But you know what kids are like ... they leave home and grow up. They grow beards and forget to wash. They start to think about girls. And then they come home again. Like any male goat, he has developed a few bad habits and it's a good job that you can't view this blog in full 'smellyvision'. The odour of a male goat in season has to be experienced to be believed. Walking a very large and powerful new male through a group of 150 girls is quite a challenge but I managed to get him in without any mishaps as we had the element of surprise on our side - I managed to unload him out of the trailer and get through the back gate of the goat barn before the girls noticed we were there. I put him straight in with a specially selected group of goatlings (goat teenagers!) and they immediately all snorted and ran to the far end of their area. Although they have been getting to know our on-site males, they have not yet had the opportunity to experience a large male at close quarters and Daramac was a bit more than they bargained for!